Our family business has one blacksmith who works with Damascus steel. - and the blacksmith’s trade (making the blades, springs, etc.). 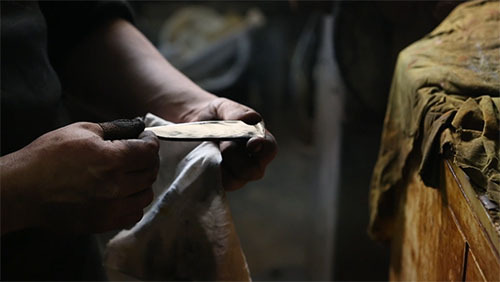 In the blacksmith’s trade, we have a specialty: we produce our own Damascus steel, a steel composed of layers and with unique patterns. These are the different steps involved in producing our Damascus steel – it all starts out with the steel strips and ends with the finished product. It is because of this lengthy process that our traditional craftsmanship can guarantee that every Laguiole is a unique object. A blacksmith’s trade requires special skills. There are various methods for making Damascus steel. Our blacksmith makes forged Damascus steel in our workshops. 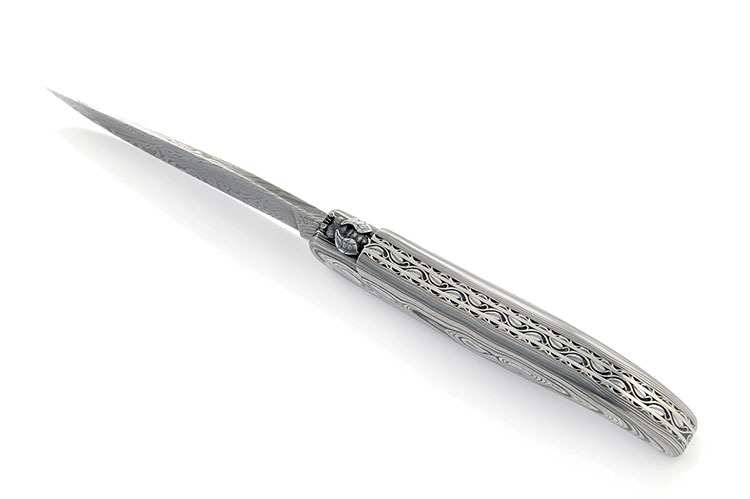 Damascus steel originated with a style of blacksmithing that dates back over 2,000 years. The exact origins are not known. Archaeological digs in northern France led to the discovery of a cache of sidearms made of ‘soft’ and ‘hard’ metals that had been welded together (dating back to the Merovingian and Carolingian periods). Damascus steel has survived for centuries, has crossed continents and stood the test of time. Impressive swords, barrels for canons and guns, etc. – these works of art and collectors’ items have forged its reputation. Damascus steel was rediscovered for knifemaking by American blacksmiths 30 years ago. We make forged Damascus steel in our workshops. The blacksmith stacks up identically sized layers of steel, alternating low-carbon and high-carbon steel. They create a billet (using different types of steel, depending on the type of blade being forged). The steel billet is heated until the right temperature is reached for the different types of steel (a gas-fired furnace allows even and constant heating in every section of the steel): it is forged. The billet is hammered while hot so that the layers of steel in the billet form just a single homogeneous block. 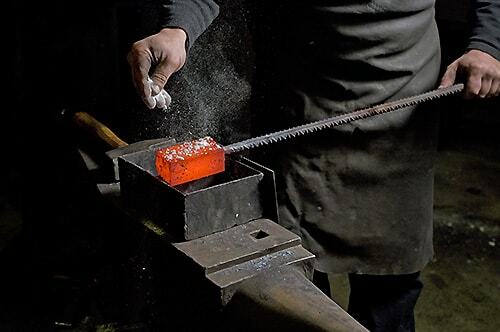 After welding, the billet is heated and then flattened in order to be able to draw it (to maintain a steel bar with an homogeneous section, regular straightening on the anvil while hot). Now the billet is double the length it is cut. The two sections are folded on top of each other. As these two sections are distinct from each other, the previous step is repeated: welding the two sections, then drawing the billet, which become homogeneous again. 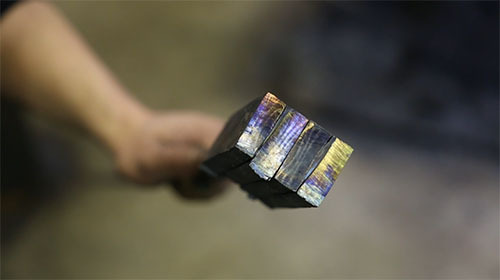 This process of folding, welding and drawing is performed as many times as required to obtain the desired number of layers in the blade (if, from a first billet of five layers, the aim is to end up with a blade with 320 layers, it is necessary to carry out six cuttings/weldings and drawings in succession). In order to obtain the required thickness and shape, this billet of Damascus steel is hammered while hot and passed through the rolling mill. The blacksmith is able to obtain between four and eight single blades from a billet of Damascus steel crafted in this way. All these steps are performed by hand on the grinding belts. Etching (to produce the contrast between the different steels used) is carried out after burnishing the blade. The blade is immersed in an acid bath and then in a bath that neutralizes the action of the acid. 10 - Forming of Damascus steel blade is finished. - easy to care for: if you use it regularly, wipe the blade each time you use it. If you use it on occasion, remember to grease the blade to prevent fading of the contrast between the different layers of steel (silicon grease, white grease, etc., containing no acid).